I remember making spiced Oranges every Christmas season since I was a child. It brings back so many pleasant memories and instant Christmas spirit! The smell is just divine and the craft itself is so simple. And the oranges look so pretty if you arrange them in a bowl or hang them. 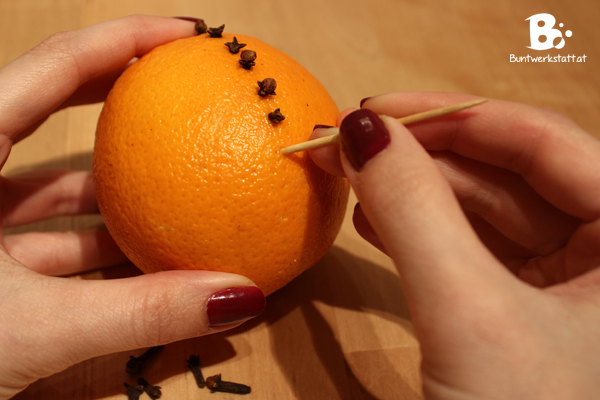 You just ned some oranges, whole cloves, 1 toothpick and a sharp knife (wich is optional). 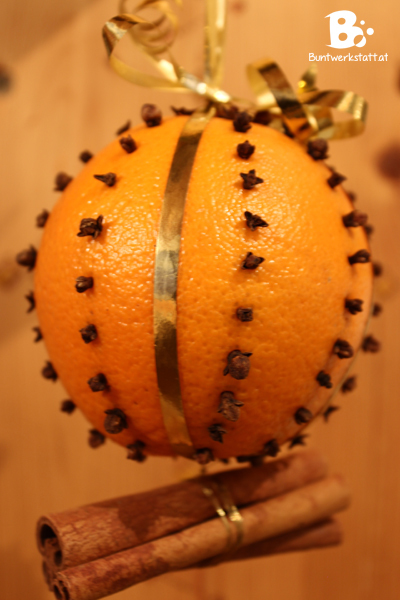 You don’t need special oranges for this craft. However, oranges with a thicker skin will last longer. 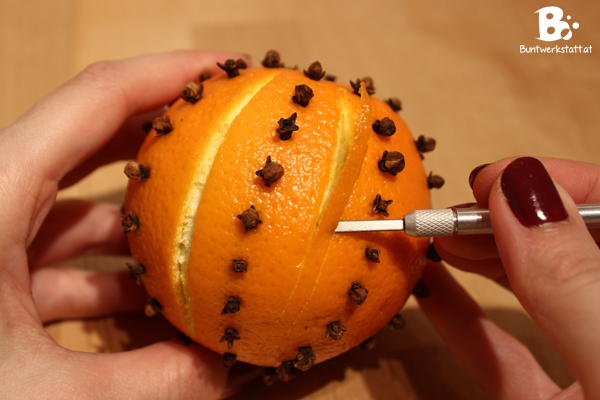 Poke holes with your toothpick through the skin of the orange. Keep a dishcloth ready because it can get quite juicy. As far as patterns go.. straight lines work best, but you can do anything you want. Spirals, simple symbols, even letters. Wrap a ribbon around your orange like you would do with a gift. Then you can hang your pomander in your room. You could also decorate it with some cinnamon sticks or short fir branches. Take care to pull the ribbon very tight. The orange will loose its volume once it dries. If you want to experiment a little, you can cut some patterns into the skin of the orange. You can use a cutter or a sharp kitchen knife. Even a peeler works, but the strips will be wider. Obviously this technique is not suitable for children. Cut parallel lines into the orange. Take care not to cut too deep. The cut should only be superficial. Hold the knife in a flat angle and remove the peel. You can do all sorts of patterns this way! 🙂 Have fun!